Fluctuating fossil fuel costs and concerns about climate change have thrust low-cost, domestic renewables, like wood, into the energy spotlight. The enactment of North Carolina’s Renewable Energy Portfolio has increased the interest and opportunities to burn wood fuel to make electricity, heat, and steam. Favorable policies that incentives heat and energy production have facilitated a right-sized domestic market for wood energy. This factsheet reviews the air quality impacts of supplementing fossil fuels with woody biomass and current regulation on emissions from wood-fired plants. Burning wood in a power plant or industrial operation is among the cleanest solid energy sources currently available. Complete and high temperature combustion under controlled conditions ensures low emissions from wood energy. Regulations require the monitoring of stack gases and particulate emissions to limit and reduce the amount of pollution. Some people may envision smoky wildfires, wood stoves and residential fireplaces when they think of wood energy. But today’s wood burning facilities are light years ahead of the 1970s version wood stoves, standard fireplaces and wood fires which can pose problems for local air quality. Variations in wood combustion efficiency result from age of equipment, design and variations in moisture, fuel size, combustion temperature and air mixture. When wood burns incompletely or slowly it emits smoke, ash, odors and windborne particulates that can impact regional air quality and human health. Industry is by far the largest user of wood energy, including power plants, factories, industrial facilities (especially paper mills). Fossil fuel conversion to wood energy has been motivated by cost-savings and availability of woody residues. Most wood-processing facilities fully utilize their internal residue stream of wood sources for steam, heat and electric energy production (in some cases capturing efficiencies that approach 80 -90 % versus traditional powerplants that make be closer to 35-40 %). Wood’s cost-saving benefits may get an even greater boost with renewable energy and climate change policy that avoids traditional fossil fuel energy sources. Regardless of the motivation, wood is a valuable fuel and feedstock. Current and future users will be motivated to fully combust and extract the maximum amount of energy (and value), while minimizing pollution. All industrial fuel users must comply with clean air standards and regulations regardless of the fuel type. Industrial combustion facilities are regulated by the United States Environmental Protection Agency and NC Division of Air Quality. These agencies manage air quality, through regulation, permits, and enforcement to ensure that new or existing facilities minimize air quality degradation. Regulations apply to all major combustion facilities, including specific emissions related to wood fuel combustion. It is important to note that emission standards are strictest for larger-scale facilities. Figure 1 illustrates that a wood-fired power plant with modern emission control equipment emits 1⁄500 to 1⁄280 of the emissions of a wood stove, for the same amount of wood fuel input. Figure 1. Total particulate matter from various wood-combustion systems (lbs./ million Btu output). There are several air pollutants that any industrial facility must control regardless of fuel used. The most common regulated pollutants for oil, gas, coal and wood are nitrous oxides (NOx), carbon monoxide (CO, a product of incomplete combustion), sulfur dioxide (SO2), mercury (Hg), and particulate matter (very small, airborne particles). Greenhouse gases too have become a significant concern in recent years. In this section we will discuss several fuel sources in the context of each of these pollutants. The following table provides a comparison among various fuel emissions. Natural gas is considered the cleanest industrial fuel because it can be burned to generate low levels of NOx, CO, SO2, and particulate matter, in comparison to other fossil fuels. Of late, natural gas has become very inexpensive and the go to choice for replacing coal buring electricity plants.. The use of oil as industrial fuel in the United States has declined because of very high cost; it is included here for comparison sake. Oil is available in different grades, and while the NOx and CO are usually low, sulfur levels in oil can be high, requiring methods to control SO2. Wood as a supplement to coal shows promise. NOx emissions from wood are generally less than from coal, with studies reporting that mixing wood with coal reduced overall NOx from the facility. SO2 is much lower with wood than coal. Depending upon where the coal comes from, coal can contain 75 times more sulfur than wood on a per unit heat value basis. Therefore, while sulfur removal is a large part of the effort in coal-fired facilities, wood energy facilities generally require little effort is to meet SO2 emissions standards. There is technology and equipment available to effectively control the NOx, CO and SO2 from both coal and wood energy plants. Wood combustion for energy results in negligible mercury emissions when compared to coal sources. Coal and wood present additional air quality impacts compared to oil or natural gas. As solid fuels, coal and wood vary greatly in quality, energy value, moisture and ash. Variation in fuel quality makes handling the fuel, ash and emissions more difficult. The control of fine particles is required for all solid fuel energy facilities as they are swept up in the combustion air stream and out the stack. While fine particles may not be toxic, per se, breathing extremely fine particulate matter has deleterious health impacts. Wood’s distinct advantage is that it contains about 90% less ash than coal. Effective methods of control of particulate matter have been developed for both coal and wood combustion facilities that remove most particulate matter from the exhaust air. The particulate matter from either a coal plant or a wood plant is higher than a natural gas plant, but particulates from both types of facilities can be controlled to minimize air quality impacts using best available control technology (BACT). Particulate matter is the solid matter or very fine droplets that result from combustion or through secondary physical and chemical conversions in the atmospheric. Visible at larger sizes and invisible in its smallest form, particulates are the air pollutant of greatest concern when considering wood combustion. Particulate matter is a generic term and is defined without regard to chemical form in the Clean Air Act (Section 109). Small particulates range in size from 10 micrometers to 2.5 microns (PM10, PM2.5) and less in diameter. The smallest particles cause greatest human health concern, since small particles can lodge deep within the lungs when inhaled and remain airborne for longer periods and distances. 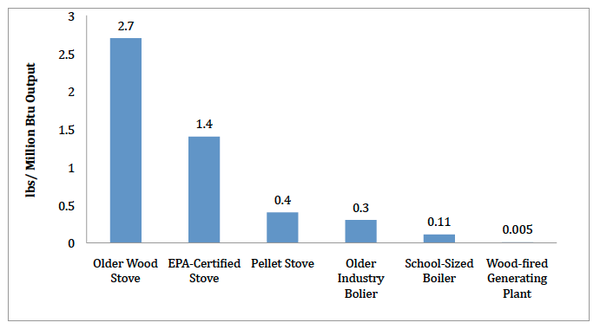 Many wood-fired boilers employ a “tall” stack of sufficient height to disperse emissions and reduce ground-level concentrations of particulate matter (and other pollutants) to mandated levels. Elaborate cyclonic and electrostatic precipitators (dry and wet) scrub the exhaust and collect particulates in the modern wood-fired operations. Therefore, most references to older wood burning systems may overstate wood combustion emissions relative to corresponding gas and oil systems of the same period. Specific wood-fired operations use the best available control technology (BACT) to ensure that they meet emission limits, prevent pollutant and associated deterioration of air quality. Wood energy is the only traditional industrial fuel that does not substantially add to atmospheric carbon dioxide in the long term, if wood supply comes from sustainable sources and forest acreage is maintained. In the context of greenhouse gases, wood presents an advantage over all of the other fuel sources discussed in this article. While the combustion of wood and fossil fuels result in carbon dioxide and water vapor, over time the carbon stored in solid wood, roots, limbs and soil can offset the carbon release in energy production. With wood combustion there is a release of carbon to the atmosphere, which is later taken up in subsequent tree growth. Carbon dioxide release from fossil fuel combustion – oil, natural gas and coal – represent ancient carbon deposits (millions of year old), the carbon from wood combustion differs in that it is derived from recently living plant matter. Therefore, the carbon emitted from burning wood is reabsorbed as new trees grow. As long as trees are replanted at least as fast as wood is burned, wood-to-energy power plants will not significantly increase greenhouse gas levels. Fossil fuels emissions, in contrast, cannot be compensated by the same tree growth since there is not enough land to plant in trees necessary to compensate for the worldwide burning of fossil fuels. Since fuel and transportation costs comprise the largest operational costs associated with combustion-based steam electrical generation plants, wood’s rather low-energy content (compared to fossil fuels) puts it at a disadvantage in competitive markets. Pelletization helps reduce bulk and increase energy density. Also experimentation with torrification -a thermal process to convert biomass into a coal-like material,- yieldis better fuel characteristics than the original biomass. Admittedly, there is not enough wood supply to supply the total energy needs of society, so wood will likely be an interim solution as other renewable technologies and low-carbon energy sources become economically viable. Adapted from: Air Emissions from Modern Wood Energy Systems Biomass Energy Research Center factsheet. 2 p.